When I confessed I have a thing for strollers, I left out that I have a bigger thing for slings & carriers. Since J was born, the search for the "perfect" one to carry J around never stopped. Not even now. When out and about with J, I very much prefer to baby wear as it makes going from place to place easier; although not necessarily quicker especially so in recent months. There has been much talk online about the safety of different types of baby slings and carriers. What's true and what's not will very much depend on you to ensure your information sources are reliable. For me, I usually read up on the brand I intend to use, complementing it with other medical reports that I can find online. More importantly, I like to try it out with the bub, at the same time, always ensuring I use the sling / carrier in moderation. Allowing myself and the bub time to rest when we are out and about. Other than ensuring the baby is comfortable, as mummies, we also need to make sure the carrier does not put unnecessary strain / stress on our backs or waists. I started with the most basic, and I would say my favourite to date - The Pupsik Pouch. I used it on our very first trip to the pediatrician. I used it when he cried non-stop at home. I used it when I went downstairs for my evening walks. I used it when J was only a teeny weeny baby till he is a 12kg toddler....although I am struggling to fit him in nowadays. I have been using the front carry method for a long time. 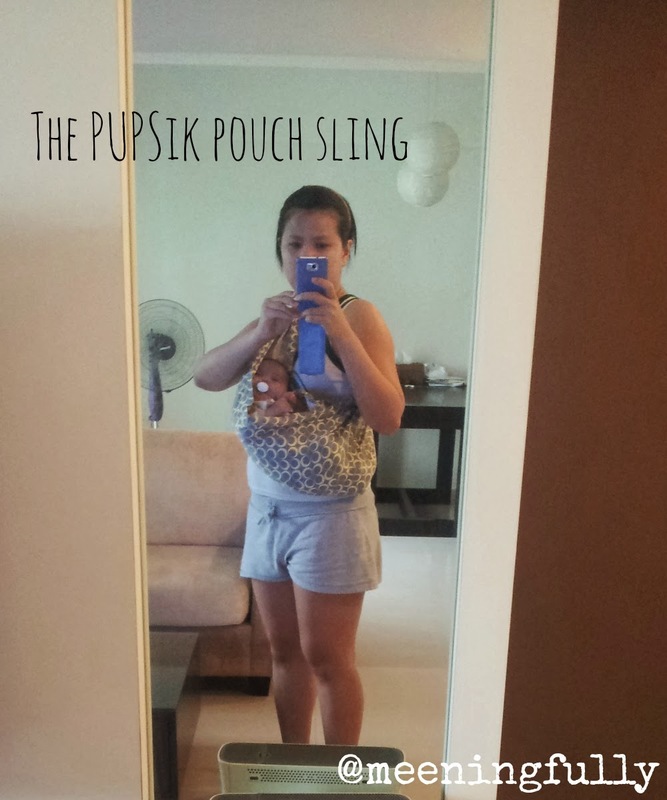 What I liked about the pouch sling is that I get to have J very close to me, and more importantly it is very easy to wear and keep. It folds away compactly, which takes up very little space in my diaper bag. However, prolonged use does make my shoulder blades a little sore. J is in a slightly awkward position as the sling was not positioned properly. It takes a while to get use to wear the sling, but once you get the hang of it, it can be done in seconds. This is also very convenient for breast-feeding. Before J arrived, I was gifted with a mini-monkey sling. My mummy friend is an advocate, and wanted to share this with me. I tried on several occasions to use it, and I must say, J was more comfortable in it when in the cradle (in this case the banana) position. So there was a short period when I used the mini-monkey when I had to carry J in that position. But, the moment he could do a Kangaroo, I switched back to the Pupsik pouch. The mini monkey is adjustable. So, it can be shared with the Hubs who could be bigger in size. It is well padded on the shoulder area, which helps in lessening the aches. This was taken when he was fussing in the evening at 2 months old. He loves being cradled, and the sling allowed me to continue with my chores while keeping him quiet. The other carrier that was a great help till J became a little too heavy was the Snugli. I often got questions why I chose this over other brands. No particular reason. I read up, and most brands do the same thing with a great level of safety. And, what attracted me was the soft material which at that point looked really comfy for the baby. It is also really easy to wear with just one clip. Needed that convenience as I tend to take J out on my own very often. I own the front carrier, which is of a more dated design. There are apparently newer and more chic designs in the US. Unfortunately, it is not easy to find them locally. 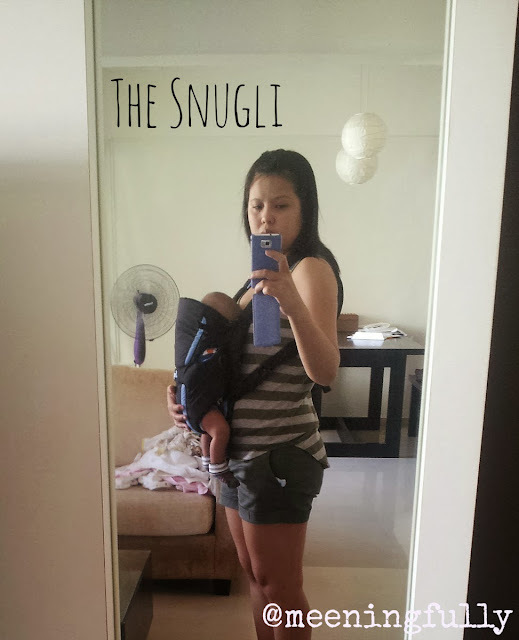 But, I am loving the Snugli as it gives really good upper back support for me. The padded shoulder straps helps relieves the pressure on my shoulders. However, when the baby gets a little too heavy, i do feel a little strain on my lower back and hips as I try to balance myself with every step I take. The carrier can take weights up to 13 kg. But when J turned 10kg, I abandoned the carrier and started looking for alternatives. It would have been great if they have the front, back & hop Snugli available in Singapore. Love how the carrier allows J to snuggle up against me. To ensure you don't hurt you back in the process, you must ensure you secure the hipseat tightly and securely around you waist and not your hip. Apparently, there is a new version where the wrapper comes with two shoulder straps. That good perhaps distribute the weight more evenly. While J is coming to 18 months old, and knows how to walk. But, he is also at the stage where he loves to stick to me and wants me to carry him when we are outside. His current weight also means I will need to continue looking for the right carrier for him. At this point, I will continue with the hipseat. Do you have any carrier experience to share? I would love to hear them! 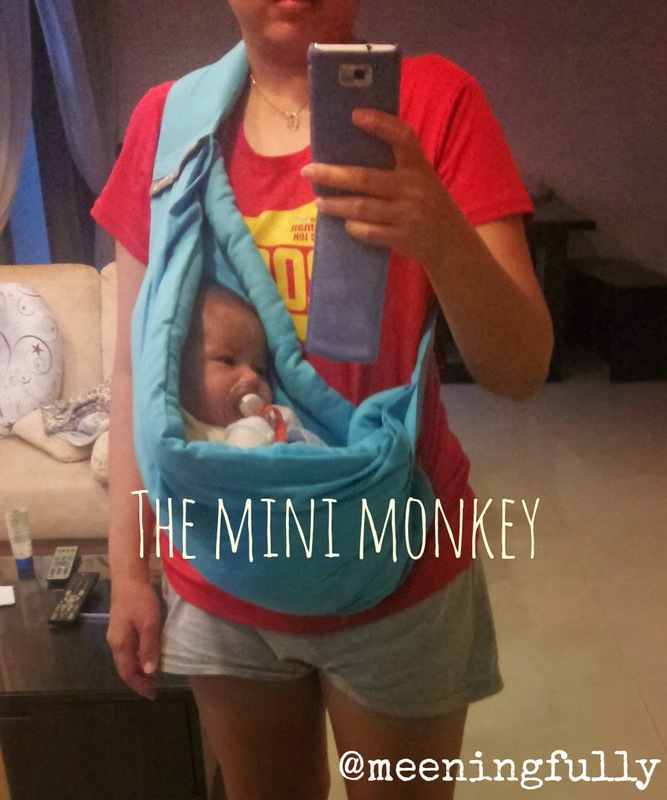 Disclaimer: I am in no way related to the brands or suppliers of the above mentioned baby slings and carriers. Opinions are 100% my own.